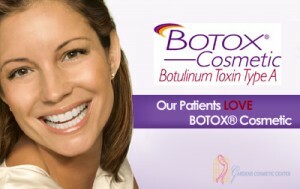 Ad for Botox Cosmetic. Allergan hid information from doctors and patients about the dangers of injecting botulinum toxin into the body. Dr. Sharla Helton, an accomplished obstetrician in Oklahoma City, won $18 million a long-running legal fight against the maker of Botox, after she contracted botulism poisoning as a result of getting injections of Botox Cosmetic 2006. Botox Cosmetic, which is injected into people’s faces to reduce the appearance of wrinkles, is made from a highly potent neurotoxin produced by the bacterium Clostridium botulinum. Botulinum toxin is the most acutely lethal toxin known to man, and has been considered for its potential as a biological weapon. Just four hundredths of an ounce of undiluted botulinum toxin is enough to kill one million people by giving them the nerve disease botulism, which causes paralysis. Allergan must dilute their toxin so much that the amounts in its drug Botox cannot be measured in conventional terms. One “unit” of Botox is the amount that will kill one half of a test population of laboratory mice. A typical injection of Botox is 20 times that amount. Even very slight errors in how and where a doctor injects the drug can potentially cause significant and even lethal health problems. Dr. Helton put herself through college and medical school in Oklahoma, became a gynecologist/obstetrician, and then returned to where she grew up to deliver babies in her home town. She was a co-founder and then became director of Lakeside Hospital. But her string of life accomplishments and all she had work for collapsed after she got injected with Botox Cosmetic in June, 2006 and was subsequently diagnosed by the National Institute of Health with botulism. After her injections, Dr. Helton started experiencing profound weakness and exhaustion. She became bedridden and after several months could barely walk 100 feet without becoming too fatigued to continue. Her Botox injections also caused her to start having pain and numbness in her arms and legs, which she described as feeling like she was being electrocuted. This turned out to be a permanent condition, which caused her to have to give up her highly accomplished medical career. In the trial against Allergan in 2010, Dr. Helton’s lawyers presented evidence showing that for many years Allergan was aware of the danger of botulism occurring from use of Botox, but had denied any connection between the two in promotional materials it supplied to doctors and patients. One particularly troubling piece of evidence was a study Allergqn commissioned from an independent drug safety company called Biosteria, Inc. The company examined 207 adverse event cases involving Botox and found they resulted from “spread of toxin” throughout the patients’ bodies — a euphemism for botulism poisoning. Allergan mae Biosteria re-write the report four times until it reported that the number of cases resulting in botulism was just 26. The report was never disclosed to the FDA or the public, and Biosteria’s name did not appear on the final version. The report was only disclosed when it became evidence in Helton’s trial. The jury in the 2010 trial awarded Dr. Helton $15 million, but Allergan appealed the verdict claiming there is no evidence Botox can cause botulism, but the Oklahoma Court of Appeals upheld the jury’s verdict in September, 2013. Allergan then appealed the verdict to the Oklahoma Supreme Court and on May 5, the high court unanimously denied Allergan’s appeal. With interest added on to the original award, Allergan must now pay Dr. Helton over $18 million. The sale of Botox brings in over $1.3 billion each year for Allergan. Dr. Helton’s attorney represents dozens Botox victims who got more than they bargained for because they just wanted to remove a few wrinkles. The web site Drug-Injury.com follows litigation resulting from Botox injuries.